Water hammer is the most common home plumbing problem that can be recognized as pounding, banging and thumping noise and pipe vibration. It can also be a serious problem that can affect your water heater performance and safety. Check out this troubleshooting guide for easy and fast repair. Learn what causes it, symptoms and how to prevent or stop it. An issue will occur when water moving through the plumbing and the outlet valve is suddenly stopped, resulting in vibration along the pipeline. Due to sudden pressure change and the shock wave, pipes will usually hit against the house's framing, creating a banging or thumping noise. After the water is stopped abruptly, the high-intensity pressure wave that is created will travel back and forth, between the point of relief and point where the stop is, until it dissipates in the plumbing system. Note: No matter do you live in a new or old house, a water hammer can happen anywhere and anytime. Problem is not only with the banging and annoying noise, but its destructive nature for plumbing, fittings and your heating unit. The pressure created in plumbing can reach over 60 times. As we mentioned before, the excessive pressure is built up in the plumbing system and goes from the pipeline into the tank, where permanent deformation might occur. Usually, the tank shell will expand, and by measuring the circumference at various locations along the tank, you can see how serious it is. When water hammer occurs, high pressure in the heating system and pipes banging against the framing members can cause the unstable plumbing system. For example, the flue tube installed on a gas water heater on one side, and through the wall on the other, might collapse. With the deformed vent, flue gases won't be able to find the way out, causing the flame and gas combustion to spill out from the combustion chamber. The solution for a water hammer problem and sometimes requested by a local code is installing the arrestor, such as this Sharkbite or this from Watts. 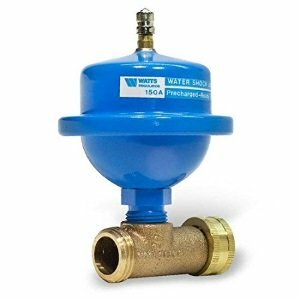 The arrestor is designed to work similar to expansion tanks, with a diaphragm that separates an air chamber from the water in the plumbing system. The air works as a cushion, absorbing the shock wave from the excessive pressure. What you should find out is the source of the shock wave so you can install the arrestor close to that point. Other solutions might be an expansion tank or pressure only relief valve that works as a sacrificial valve when working with abnormal pressures. Designing the plumbing pipes properly, replacing the undersized pipes with the larger ones is part of your solution for noisy pipes and water hammer prevention. For the existing plumbing system, wrap the insulation around pipes to minimize the rattling noise and secure the loose ones. Note: If there is damage to a tank heater due to water hammer, the manufacturer is not eligible for warranty compensation. A common question from consumers is: My water heater makes the popping noise? Is that a water hammer, noisy pipes or something else? Plumbing is not always "guilty" for all kind of noises that you can hear when running a heater, washing machine or dishwasher. The rattling sound might come from a defective seat washer, even when the tap is barely open. Moaning or chattering sound may be caused by high pressure. Ticking noise occurs when you open a hot tap, and hot water suddenly runs through the cool hot water pipe. It might also be that a copper pipe expands due to the high water temperature. The common cause of ticking noise and water hammer is if your sink or shower/tub is using a single lever faucet or due to dishwasher and washing machines' automatic solenoid valves. Sometimes a simple change of defected seat washer is the solution. More info about water heater noise find here.